Well, readers, we are back in the wonderful world of Marvel, as Stan Lee and his friends originally wrote it. Get ready for a jaunt into the Marvelous, original mainstream Marvel Universe!!! 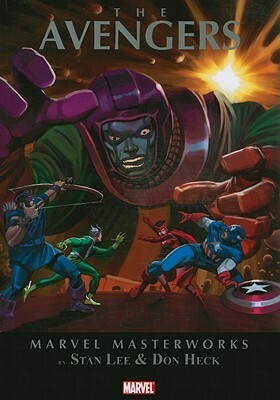 Here is the review for Marvel Masterworks: The Avengers, Vol. 3!! 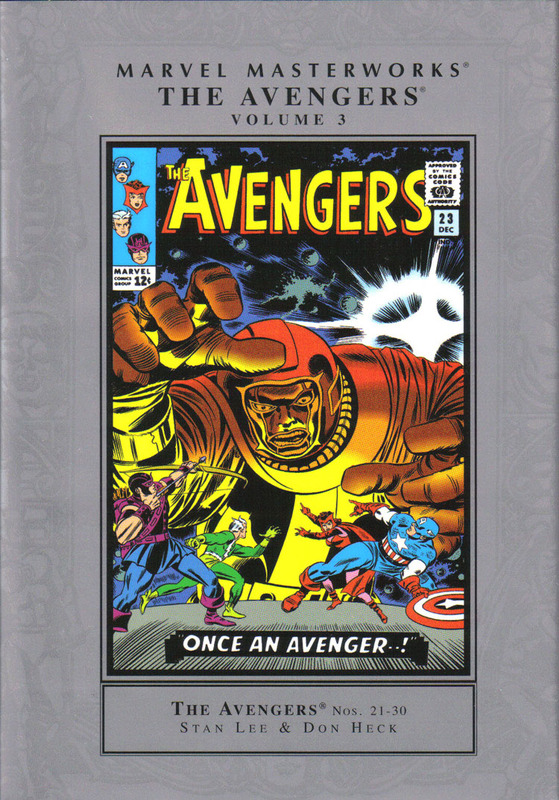 As with Marvel Masterworks: The Avengers, Vol. 2, this book contains a collection of original comics from the early 1960s. There are ten issues in this book in all – plus an introduction straight from Stan “The Man” Lee’s pen. The language in these comics is better, in some ways, than it is today. Now when I say “the language is better,” I am not referring to these old comics’ lack of profanity. That is certainly a point in these stories’ favor, but it is not the main point. What I mean is that the vocabulary used by the characters herein is wider and makes allusions to the classics. This means that the characters not only convey precisely what they mean to each other, and thereby to the readers; it also allows them to give the readers lessons in world history, myth, etc. Yes, there is a great deal of contemporary slang in the stories in this book. But there is a great deal of contemporary slang in The Adventures of Tom Sawyer, too, and only a few boneheads want to complain about that. The comics are not perfect, but they are better in several respects than today’s comics. The stories in this volume are real stories, the characters are really who and what they look like, and the artistry is well-done. Is it quite as good as today’s artistry? Allow me to answer that with a question. Are comic books about art, or are they about story? Illustrations for a comic book should be high quality, of course. But if the art is the only thing in the comic book which is good, then the comic book is not worth very much, other than as a tableau showing off the artist’s talent. The writers of the modern comics are more focused on the fleeting fads of the world than on good storytelling. The artists for the comics want to make a splash rather than help to tell a good story. The parts are all trying to get the credit for the same cake, and in the process they are destroying the recipe. This means that the finished product comes out looking more than a little unappetizing. So, readers, we have to read these old stories. We have to learn the recipes in this volume. Because when the wannabes are finally driven from the kitchen, guess who is going to have to come in and clean up the mess. That is right – we are. And if we do not know how to bake the cakes, then we are going to make messes as big as this one which is about to blow up in Marvel’s collective face. In this volume, you will watch as Captain America and his “new Avengers” – Hawkeye, Quicksilver, and the Scarlet Witch – are handed their first defeat. Tricked into damaging property by the Enchantress and accused of trying to elbow out the newest hero on the block, Power Man, the Avengers are forced to disband. And the ever-antagonistic Hawkeye is only too willing to lay the blame on Captain America! However, Steve Rogers is not ready to let the Avengers’ torch gutter and die. While his team searches for new, legit work, he sets out to prove they were set up in “The Road Back!” He succeeds, naturally, and the Avengers are reinstated as heroes. But the team is rocked by another surprise when Cap throws in the towel and strikes out on his own! Following this catastrophe, Hawkeye finds that leading a team is not as easy as he thought it would be. Wanda misses Cap’s presence along with Quicksilver. Even Hawkeye privately admits that he regrets Cap jettisoning free of the team – especially as the twins prove they are not that easy to order around. Meanwhile, having found work training a boxer, Cap is making a living on his own for the first time since awakening from the ice. He likes the work but soon discovers that he cannot close his eyes without seeing his team. He misses them as much as they miss him. But Kang has an audience besides us, for once. He is in the last remaining kingdom which he does not rule. No, this little postage-stamp nation is run by Princess Ravonna and her father. Both consider Kang to be evil and they despise him, Ravonna making no secret of the depth of her contempt for the Conqueror. Kang, though he rants against her, admits that he is unwilling to destroy the kingdom – because Ravonna has conquered his heart without half-trying! And from here, it is all-out war, as Kang finally decides that he will take Ravonna and her kingdom by force! After their adventure in the 30th century, the Avengers are lured to Latveria in the issue entitled “Enter…Dr. Doom!” Eager to challenge the Fantastic Four again, Doom wants a trial run before he squares off with Reed Richards and his family. He gets more exercise than he was bargaining on when the Avengers prove to be as mighty as the Four – maybe even mightier! Next ish, the Avengers receive a distress call from founding member the Wasp. She tells them that Attuma has captured her and plans to destroy the surface world. He has built a machine which will induce tremors in the earth, causing tsunamis and floods which will destroy the human world. Once that is done, the Ghengis Khan of the undersea world plans to march onto what was once dry land to claim it as his own! This plan goes about as well as you would expect. The Avengers whip Attuma, destroy his machine, and set him back several thousand sea-dollars, only to arrive home to another crisis. This one again involves the Wasp, who made it to the Mansion but has since disappeared! Unable to stand losing her, Hank Pym returns to active duty on the team, taking the name “Goliath” in order to help find the love of his life. The Avengers soon meet with Wasp’s abductor: Tanaleer Tivan. Better known to most as “The Collector,” he captured the Beetle and decided he wanted a superhero team for his collection as well. His target: the Avengers! The team breaks out of this problem and hits another snag. In rescuing the Wasp, Pym stayed giant-size too long. Now he is trapped at ten feet tall – and hating every minute of it. Things go from difficult to worse in no time. Hawkeye is over-the-moon ecstatic when Cap tells him SHIELD has heard that Black Widow is alive and is returning to the U.S. He then gets angry when Steve points out that the Communists would only release her if they had managed to brainwash her again. Unwilling to forget his love for Natasha, Hawkeye leaves the Mansion to find her. He does indeed meet up with the Black Widow – plus Power Man and the Swordsman! Natasha then reveals that she has been put back under the Reds’ control, and she wants Hawkeye to rejoin her in their service. The last story sees Quicksilver and the Scarlet Witch taking a leave of absence from the Avengers. Also, with Cap’s permission, Hawkeye takes on Widow and her stooges solo. He manages to best the Swordsman, his old mentor, but Power Man is not going to be nearly as easy to defeat…. Meanwhile, Hank Pym is desperately searching for a way to return to normal size. Hearing about an old colleague who has disappeared in South America, he heads there to find him in the hopes that the man can help reverse his condition. Instead, he finds a “Frenzy in a Far-Off Land!” ready and waiting to jump him! Readers, I hope I have not spoiled these stories too much for you. I know they are “retro” and probably of interest to very few of you. With Marvel’s recent alterations, which they are hailing as the new Modern, most of you probably do not care to learn where the heroes we have seen on the big screen for the last decade and a half started. But I believe that we need these stories now more than ever. Yes, they are kooky and silly, with a dash of weird in the bargain. They will not appeal to everyone; least of all will they appeal to Marvel’s blind Hierarchy of Seneschals. Still, they are the germ of the stories we have now. Without them we would not have Chris Evans playing Captain America, or Robert Downey Jr. doing a bang-up job as Tony Stark. The cast of the films owe their careers to these characters, and to forget where these fictional heroes came from is just plain bad. It means we are forgetting ourselves with them. If our memory only goes as far back as yesterday, we will never be able to make a future. Marvel is so determined to build a shiny “modern” future that it is rewriting its past, and not in a healthy way. The bosses at Marvel can make whatever changes they want. But in the end, they cannot change the past. They cannot change us. And that will be their undoing, not ours. If we forget, however – if we allow what we have learned and remember to be wiped away – then we will be undone. By learning where Marvel came from, the company can one day be cleaned up and put back on the road to goodness and then greatness. This book will help us in that. This entry was posted in Book Reviews, Marvel Comics' Characters and Stories and tagged "mainstream" Marvel Universe, Ant-Man/Hank Pym, Book Reviews, books, Captain America, Captain America/Steve Rogers, comic books, comics, Goliath, Hawkeye, Hawkeye/Clint Barton, Marvel, Marvel Cinematic Universe, Marvel Comics, Marvel Comics' Characters and Stories, Marvel fans, Marvel Female Superheroes, Marvel films, Marvel Masterworks, marvel tv shows, protagonist girl characters marvel, Quicksilver/Pietro Maximoff, Scarlet Witch, Scarlet Witch/Wanda Maximoff, Stan Lee, The Adventures of Tom Sawyer, The Scarlet Witch, The Wasp, Thor, Thor Odinson, Wasp/Janet Van Dyne on September 15, 2016 by The Mithril Guardian.